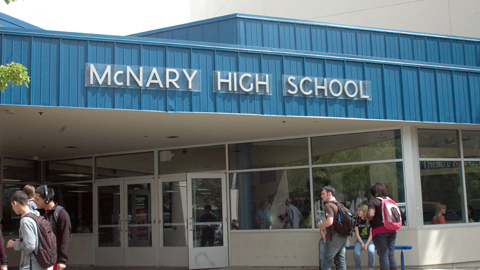 After numerous appeals to the Keizer City council, there may be some light at the end of the tunnel for neighbors on the west side of the McNary High School campus. Three nearby residents, Charles Anderson, Jeff Weekly and Michael Catlow, spoke with council members at a meeting Monday, May 1. Anderson and Weekly have made regular appeals to the council during the past several months hoping to find some sort of relief from overflow traffic and parking problems during the peak drop-off and pick-up hours at McNary. “It’s a convenience for the students, but you are doing it on our backs. Please wrap your head around that. (The students using Newberg) get out of paying the parking fees and get out of parking in that school lot. I wouldn’t want to park in that lot,” Anderson said. One of Anderson’s main points of contention is that when the school closed gates to the campus on Sandy Drive and Robindale Drive the problems associated with student traffic all moved to Newberg Drive. He objects to the school not taking similar action at the Newberg gate, and wants the city to put pressure on the Salem-Keizer School District to make a change. Councilor Laura Reid, who is also a teacher at McNary, recently met with Principal Erik Jespersen and said the school administration is looking into experimenting with reopening the Sandy and Robindale gates during peak hours, but no action is likely until this fall. “We don’t want to open them permanently and invite the criminality that was happening before. And it’s going to take a relatively large communication campaign to let students know about it,” Reid said. Reid added that even if the other gates were opened on a limited basis, it might not curtail the parking issues on Newberg, only the traffic congestion. In an display of his frustration with the situation, Weekly confessed to having put a lock on the Newberg gate in mid-March. School officials responded by cutting the gate off entirely. The action drew sharp rebuke from Mayor Cathy Clark. City manager Chris Eppley, who has urged Anderson to take up the issue with the school district during meetings and in private correspondence, did so again. Anderson asked whether the city could block off the side of the gate facing Newberg, which is city-owned. “It’s a public right-of-way allowed to be used by citizens for driving and walking. The students are members of the public. It’s not illegal,” Eppley said.